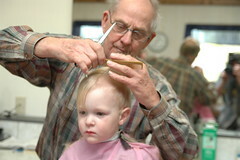 snowdeal.org > ex machina: the eric update - day 1041: odin's first haircut! 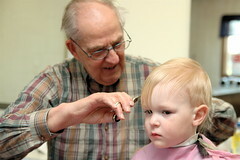 the eric update - day 1041: odin's first haircut! after over 1000 days, i almost can't believe that it finally was time for odin to visit the barber for the very first time! 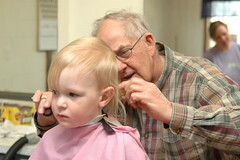 before we went, we told him what was going to happen, and he wasn't too sure it was something he wanted to do but harry the barber has obviously cut more than a few "first haircuts" and before long he and odin were chatting about this and that and the other thing, which is exactly what you'd expect from an old school barber ( i know from personal experience that if you want the scoop on what's happening in the area you only need to sit down in harry's chair ). 1000+ days? Why'd you wait so long? HE LOOKS GREAT!!! 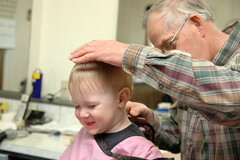 It also looks as though he did very, very well in the barber chair. He's getting to be such a big boy! I cannot believe 3 is just around the corner.